CK and Nate header: Now That's a Beach Day! Now That's a Beach Day! While our friend Liz was here, we devoted an entire day to going to the beach since we really haven't done that yet and when better to do it then when friends are visiting! We have wanted to get over to Siesta Key since we came down to FL and so last week we took the hour and a half trip over to check out, what we've been told is, one of the prettiest beaches in Fl. While we haven't had a good beach day yet, we have been to a few beaches and I have to agree that Siesta Key is by far the prettiest. It has the whitest sand and it is a really large beach so there is room to spread out. We also got a really good day with no rain so we were able to relax in and out of the water. 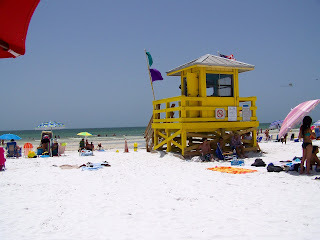 We can now officially check Siesta Key off our to-do list for this summer (although I think we'll be back). Now we need to get over to an East coast beach!